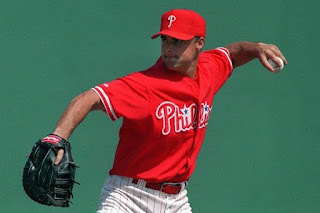 Former Phillies first baseman Rico Brogna re-joined the Phils organization this year as a coach with the Double-A Reading Fightin Phils. During his playing career, Brogna also took the field for the Mets, Red Sox, Braves and Tigers, the team that drafted him in the first round in 1988. With the Phillies, he posted two 20-homer, 100-RBI seasons. Now, he's trying to help develop the Phillies stars of the future. Recently, I talked with Brogna about some of his team's players, his time coaching and scouting elsewhere, his favorite teammate from his playing days and plenty more. Read ahead for that full interview. -Malquin Canelo's been a catalyst through the first several weeks of the season for this lineup. He's always had a lot of good tools., but in the past maybe he hasn't really stood out compared to other guys on teams he's been on. Now, though, he's starting to stand out a bit. What do you think of him? He absolutely is. I think he's playing good on all sides of the ball. He's really running the bases well. The defense at times is exceptional. He's got a lot of range and really a lot of play making skills on defense, at shortstop and at second. He's played some second base too. But that is definitely a part of his game that shines. Base running, like I said, I think he's been really aggressive with stealing and taking the extra base and certainly offensively, he's really in a good place. He's able, now, to pull his hands in, when they try to work him inside, and try to get be quick. And some of those have resulted in home runs, so he's a really exciting player to watch when you coach him and he has a variety of ways he can help you win. -The roster's pretty deep with talent, with guys having to sit from game to game. You might have Jan Hernandez, Cord Sandberg, Kyle Martin out of the lineup on any given day. You're not making the lineup each day, but is that a difficult point, to have to rotate everybody? Yeah, it's one of those, maybe, good problems to have. I think, you know, Legger's (manager Greg Legg) done a good job of rotating guys and kind of communicating it before hand. There are a lot of guys that-- you know, everybody on the roster wants to be able to get the right number of at bats and at times it's hard to do on a daily basis when we have a lot of guys that can maybe play almost every day. But, again it's a good problem to have. And it's not a problem. It's a lot of quality depth and that being said I think the guys that can play multiple positions, whether it's in the infield or the outfield, we've been trying to move them around. Legger and us as a staff have been talking about it so they can find ways to keep getting AB's and experience in different places. -You've got more than a couple guys that really can flash big time power. Zach Green's a guy that shows it, and you've got him and Kyle Martin and others. How do you go about bringing that power out of them? Well, they work hard and Kevin Riggs is working with those guys everyday and I haven't really seen too many hitting coaches work as hard as Riggsy. He's really good with hitting as far as whatever the guys need. He's always working hard and the players are working hard right along with him. They're in position to hit mistakes well and they're barrelling balls that are center cut, so yeah, one of the things we do well is, as a lineup, we get pretty deep with the amount of guys that can hit for power. So, good pitches and good pitchers are tough to hit for anybody at any level, but they want to get in a position where they can capitalize on whether it's a breaking ball hanging, or a center cut fastball-- something that's kind of quote-unquote a mistake, because really as a hitter, that's what you want to be ready for and really they are and it can be for much more than a base hit. They can punch a double in the gap or hit a homer. -What's your role? 'Cause you mention Riggs as the hitting coach, and I think I had your positions twisted. So tell me about your role with the team. It's a little bit of a watch and do everything. We kind of classify it as-- well, they added a fourth coach at every level this year. They started to do it last year, I think, but it's everywhere now in the organization. And it's more a bench coach kind of thing to help with some of the defensive positioning and also work with some of the outfielders, help with some of the hitting. It's more of a bench coach. So, when Legger had to go to his son's graduation last week from Penn State, which was a cool thing, so I got to manage for three days. And, yeah, it's more of that, instead of being specific with the hitters or with this position group. It's more of a chance to do all of it. -What brought you to the Phillies? Obviously, you played here, but had you coached pro ball before this year? Mm-hmm. That was probably one of the things that got me back was having the relationship with the Phillies in the past. I had been pro scouting with the Angels the past few years. I coached for the Angels for a couple of years in Anaheim, so I've done a combination of some minor league managing, coaching, big league for a couple years and a lot of pro scouting. I'd say the last 12 or so years, a combination of all the above, so I enjoy being in the game and being a pro scout taught me a lot about players and evaluation of players and all that stuff. -Well, it's probably several weeks late, but welcome to Reading. Welcome to the team. -So, speaking of evaluating players, what have you seen from Cornelius Randolph? Another good prospect. I think he's really starting to-- the other day he had three hits with a double to right-center and a double to left-center. Tonight just late on a couple fastballs, but right there where he wants to be. And he's got a great attitude, even when he just misses a ball or pops it up and was close, he knows he's close. He's aggressively running the bases and works hard on his defense. Just a really fun kid to be around. He loves to work, has fun playing the game. I think once the hitting-- you can really start to see him gain confidence and rapidly, so I think as this season goes and he starts seeing the (teams in the) league a few times and get a chance to make adjustments and learn the level, the second half of the season, as we move into that, you'll see more consistency. -Damek Tomscha has been putting up a lot of good numbers for the team. He's been really consistent. Do you think he's ready for a bigger challenge? I do. Yeah, no doubt. I'd love to see it happen. I think he's very reliable defensively and that's a high compliment when you're reliable. Catch the ball, make the throws and get all the outs you're supposed to. That's not easy to do. And he does that exceptionally well. He's actually a very heads up base runner as well. He'll take the extra base when some people don't think he would. He's a very intelligent player. He sees the field. He competes so hard in the box. You can just see him compete. It's almost like you can see it sweating out of him. But you love it that he competes and finds a way to barrel the ball and hit it. Uses (the field) line to line and if you leave a pitch out over the plate he can hit a homer. He's really kind of the coaches dream. He's like a coach on the field. He competes like crazy and is a all-around solid ball player. I would love to see him get a chance to get challenged whether it's the middle of the season or sooner, or whenever, 'cause he's shown that he has the ability. -Last thing for you. You're describing Damek as this great player to have around the team and it makes me wonder who was your favorite teammate during your playing days? Gosh, so many. So many. It was fun playing with so many guys, but when Scott Rolen and I were locker mates for four years in Philly, you know, he was quietly one of the funniest guys I've ever been around. So smart and so quiet, but so quietly hilarious and brilliant and he was-- it's hard to pick one guy, but he was awesome. We lockered next to each other, we hung out, we would go get McDonald's together after games sometimes when no one else would be going to McDonald's and (we'd) hang out and have fun. -Do you guys stay in touch these days? A little bit. He doesn't want to be found. He wants to be somewhere on the globe and be like Where's Waldo. Where's Scotty? You know, I'll text him sometimes and he'll go, "Yeah, you got me in Greece." It's always like we talked just yesterday whenever text or call. Good dude!